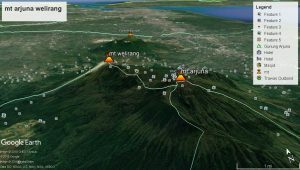 The Arjuno-Welirang Volcano Complex has several cones at its peak: the Arjuno Mountain Cone (3339 m above sea level, the oldest cone), the ‘2900 m asl) cone, the’ Kembar II ‘(3126 m above sea level) The cone of ‘Kembar I’ (3030 m above sea level), and the ‘Welirang’ Mount Cone (3156 m above sea level). The cones are formed by the displacement of the eruption point which forms the straightly south-northwest direction and is controlled by a normal faults. In addition to these cones are also some parasitic cones which are the result of a side eruption on the body of Kompkeks Gunung Arjuno-Welirang. The parasitic cone is Mount Ringgit (2477 m asl.) In the northeast, Mount ‘Pundak’ (1544 m asl) and ‘Butak’ Mountain (1207 m asl) in the north, and two other cones namely Mount Wadon and Mount Princi in the eastern body. Arjuno-Welirang Arjuno Complex rocks are produced by three central eruptions from Mount Arjuno Tua, Gunung Arjuno Muda and Mount Welirang in the form of lava flows, pyroclastic flows, pyroclastic and lava flows that spread to the north and west (Vulcanology News, Special Edition, 1992, Mount Arjuno-Welirang).